Good aptitudes are recognized to the Wooden Post. Somebody says that their short longevity over the years make of the Wooden Post a good support for the present only.. but the matter is just the choise! Basically the pine wooden post come from the North Europe where is purchased according to the our internal rules. After that, they are sent to our warehouse. 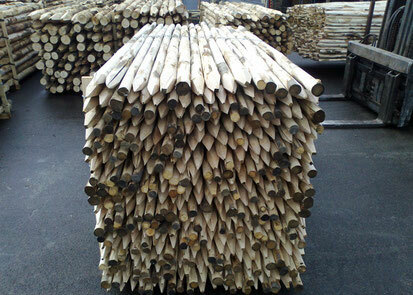 The pinewood trunks are stripped, sharpened and sorted according to their diameter. They are piled up on themselves to allow the air passage inside. After being stripped and then got white (which means the right humidity percentage inside), our wooden poles go to the second part of the process, i.è impregnating. This kind of salt is suitable for this operation. Several tests has been done before obtaining the approval and thanks to this, our wooden Poles have now the right authoritazion to be incorporating into the surface. The impregnating process is pretty simple. The wooden poles are inserted into a cylender where they stay vacum-sealed for 30 minutes. After this, a worker inserts a mix of water and salt for other 15 minutes at a pressure of 8 bars. As soon as the wooden poles are not able to absorb liquid anymore, the worker keeps out the poles from the cylender and takes them to rest for the next 3 months. During every cycle, tests and samples are checked to finale the product at the best conditions for the market. 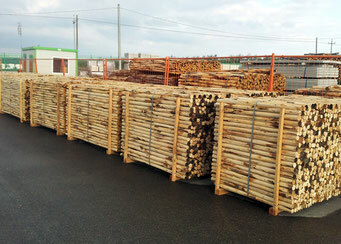 Only after this long process, around 6/8 months, our wooden poles are finally ready for the market! The brand new wooden pole for agriculture field and the vineyard one. It’s covered and reinforsed by an Inox tube just where the problems can attack. Sturdier than a wooden standard pole, it’s good for the mechanical harvest and also for fencing and gardening. This kind of Post joins two particular factors very important in the modern winegrowing. 1) It solves the problem of durability thanks to the Stainles Steel Tube giving to the Post a sturdier support for a long use into the ground in every kinds of weather conditiions. often the Wooden Post is selected as the only "Natural Support" according to the Regional Laws. For example in our Region, Piedmont, for Unesco's reasons the winegrowers must respect the Natural Impact of the hills. 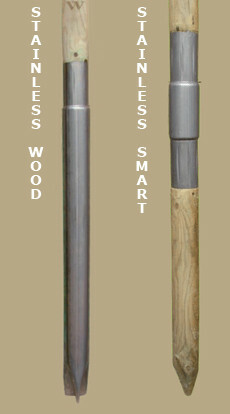 That's why a Wooden Support implement by a Stainless Steel tube can be chosen as a Post for the entire Vineyard Life. 1 - We use only the best torned European pine treated by autoclave with preservative salt- DIN 68800-3. 2 - Then we put the inox by an expecial way (CRIMPING) to force the rain water take inox over outside, get the ground and leave the pole dry. That is the way to guarantee the long lasting. 3 - The poles are fire marked because a quick identification. This kind of patent concern a wooden pole for vineyard with a treatement on the pointed side by waterproof covering or better , inox steel. Corncern a covering with the same diameter on both side and the same internal diameter of the pole. The system refers on any manufacturing where a tube fasted by machine on a pole avoid water to penetrate inside. The focus is to reach a long lasting in vineyard or agriculture environment. Cover by inox by 25 cm on the collar for all size. Accessories for Vineyards collaborates with a leader in the production of Natural Chestnut Wooden Poles. As par those in Pine, they are stripped of the bark and then sharpened. Thanks to its natural high concentration of tannins, it does no need treatments to increase the duration. We advise the use of ChestNuet Wood Poles to all the winegrowers! Thanks to their high-strength, the chestnut wood pole are considered as a top-support for the vineyard layout. More over, they do not make any trouble to the mechanical operations, such as, pruning, harvesting. Basically, in all these kinds of ambient, a sturdy and longlife support in chestnut is considered pretty suitable to support the vegetation over the years.The chestnut wood has a dry mass of 530 kg/m3 with a Brinell Scale of 18 N/mm2. In presence of iron materials, it could have chromatic effects due to the high presence of tannins inside. We apply the surface charring strong a technique very ancient that serves to preserve and enhance the technical characteristics of chestnut wood. This process allows you to obtain strong a layer waterproof and to take advantage of the antiseptic action of fire and smoke in an ecological manner, allows you to emphasize strong its natural adaptation to the typical landscapes of our territory. The use of this substance is recommended in case of particular conditions "high humidity or high bacterial activity of the soil". Stripped of the Bark and sharpened.